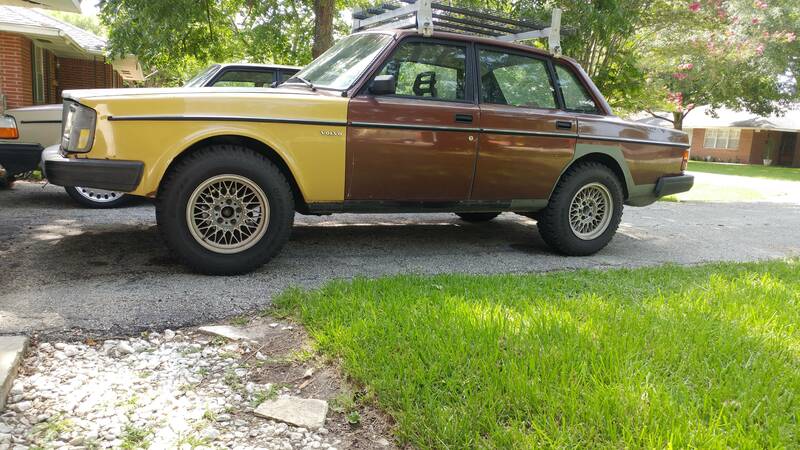 Building an Off-road/Soft Road 240 Wagon? I disagree, car tire ain't going nowheres. Yeah, car tire ain't goin' anywheres on an all-steel front 145 on a smooth track. Anyway, back to your normally-scheduled thread about trail-crawling 240's. Thanks for the responses guys. This is exactly what I had in mind. I'd really like to see the particulars of it. 240 Apocalypse edition. I'd appreciate any other inputs guys, thanks again. RallyBrick, I'll shoot ya a PM. Iirc that guy was using ipd overlads in the rear and some sort of spacers all around. Only modification needed is slight fender lip rolling in the rear. Barely kisses the front spring perches. The tires alone provide about a 1.5" lift. For a car that is 2" lower with 2" less suspension travel stock, and a weak rear subframe to boot? Uh, being lower, and planning on going even lower, is the reason I want to protect the pan. And at any rate, plenty of 7/9 cars racing off-road over in Sweden, so yes, it IS surprising there's no aftermarket one available. And who cares what car is ">" than another. That's a silly thing to say. I like my 7, just like I like 2's, 1's, 8's, & 9's. I think I'm going to try the gradual approach and see how it goes. Since my springs are chopped, I need new ones regardless. I'll probably try some XJ springs on the rear, Diesel springs on the front, and a set of 27 x 8.5 R 14 General Grabber AT2's. Anyone have a source on some Diesel springs? If you can get ahold of the GT springs, via FCP groton they are a reproduction spring and will raise the front up a good 1" or so. I can't access the site right now due to a slow hellish connection otherwise I'd provide a link. I looked on FCP for those springs and couldn't find them...they all have the same description. If you happen to find a link, that would rock. FCP claims to have front diesel springs. I wonder which would result in more lift, Diesel or GT springs? This. See if you can have FCP measure the wire thickness of the springs, though. From the factory, SOME of the diesel springs were 14.2mm and the GTs that had the stiffer front springs also had 14.2mm wire thickness springs, but they were a shorter overall height. I've also had some springs that were removed from diesel cars but they are only 13.9mm thick. That being said, the springs on my stock 1987 244DL are 14.0/14.1mm thick! Maybe they are just the same 13.9mm springs but have really thick paint. All that jazz aside, I recently purchased some "used" black springs with tags on them that say made in Sweden and I am wondering if they are these "diesel/heavy duty" springs made by Scan-Tech that FCP is selling in the link above. They're 14.6mm in the front and the rears are 14.2mm(larger diameter than even the stiffer, lowering springs I have from TME and Lesjofars!). ask me what kind of stupid i am today? 92 240 wagon, aw70, (tool box, prepping to be driver) new mexico clean! 92 745tic mild stuff done(7s and 9s are not 240s, pulling engine to build for the 77, ask for parts, body is clean) for sale? 95 chevy g20, family pet pig. Last edited by odinthewanderer; 07-07-2012 at 05:03 PM..
Last edited by odinthewanderer; 07-07-2012 at 05:30 PM.. I am running on the front coil-over sleeves 2.5" ID springs 10" length #325 rate. This raised the front of the wagon about 1.75 over stock height. This is with the perch at the lowest setting. Rear I have 14" #220 rate. With some rear coil-over hardware made by Jerd. Rears are at least 2" higher then stock. Rides great no body roll, corners excellent, best mod yet. This. I want to see what it looks like raised up and with those tires, i've had my eye on a set for a while. Here is what you do to seal the deal, text her a picture of your nut sack stretched over a pine cone. I don't know why but girls totally dig it. That skid plate stops at the cross-member and does not protect the sump. If you're serious about going off-road, might be wiser to go with a bigger skidplate, but then you start dealing with heat issues (doesn't dissipate from the engine bay). But then this is overkill and for going fast over rocky roads, not trail crawling. Per John Lane "Overkill is consistently more fun." HDPE from McMaster-Carr is also a good solution. Slick, so it slides over rocks pretty well, it's light, and can be cut easily. Aluminum channel stock or L-brackets (readily available at Home Depot) work well to secure it in place and form it. 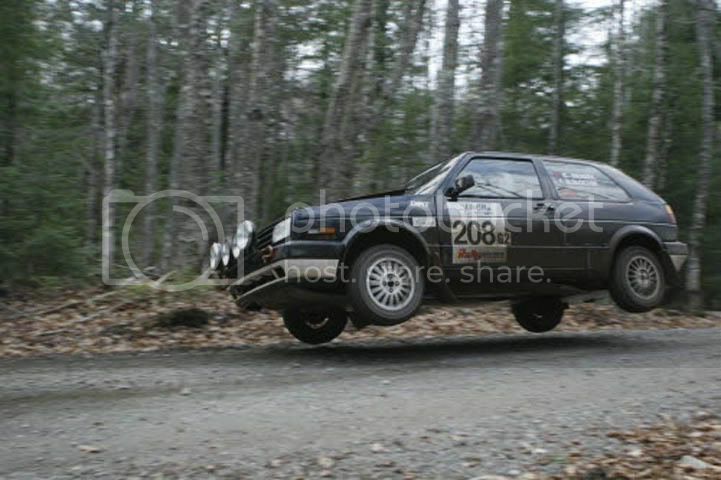 The skidplate in the rallycar is one intended for a VW Golf or Scirocco from a million years ago. Aluminum, strong and we built steel brackets so that we could bolt it to the car and to the crossmember. It has served well + adds strength. Lots of room around the engine for heated air to get out..... Use enough radiator and fan to do the job. Got the spring cups raised 2", cherokee springs under the rear, S10 shocks on the rear and a set of 235/75r15s on it this weekend. Trimmed the front lip of both the front and rear fenders. Lots of rubbing on the stock mudflaps so they are coming off with more trimming to see how that works. May also add Jeep XJ front levelers in the rear to raise it up a little further. Found the front frame is so out of shape that the IPD skid plate won't remotely fit. Fun regardless! If you can score a locker rear end that would help in your quest for traction. 235s are damn big. Switching to 205-225s for some more clearance to wheelwells! I will report after the Gambler 500 and more commuting. Didn't realize the 500 was next week. 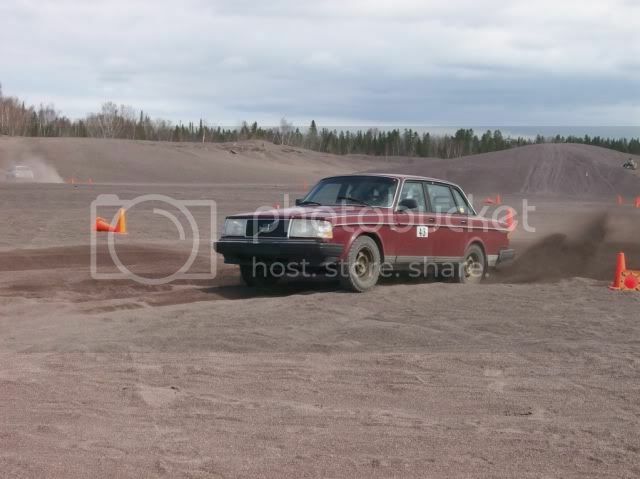 Would totally go in my stock wagon if I had a co-driver. Know anyone who's looking? Navigating the Siskiyous in a 3 wheeled Volvo will not end well. Chris in Austin (crazychopstick) lifted his 245 with spacers up front, jeep wrangler front springs and modified wrangler shocks out back. If you could find someone to weld, you could raise the front even more by extending the strut tubes and putting a spacer in the bottom of the housing. Or, you could just cut and re-weld the lower front spring perch higher(2.5" is about as high as you want to go) This was done on mine up front with V8 Cherokee springs and dodge van shocks drilled out to fit the volvo hardware in the back.